Welcome to the most unique wedding venue in Ireland where your wedding dreams come true. What makes us unique is not only the location but our warm family run atmosphere where all guests become an extended member of the family. Many congratulations on your upcoming wedding. Right now, you are probably looking at numerous locations for your wedding and reception. 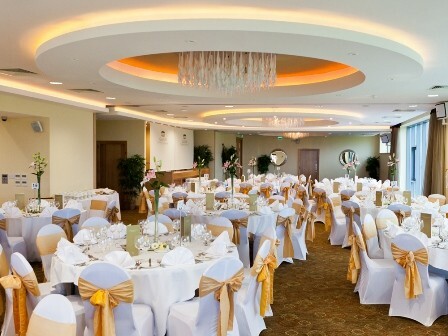 Glasson Hotel and Golf Club is a 4-star family-run hotel in Athlone, Westmeath, and we have been successfully holding wonderful weddings for over 15 years. This year we have even more exciting news for Brides & grooms to be, our NEW BANQUETING SUITE, The Dillon Room opened in April 2010. Here are just a few of the reasons that brides, grooms, and their families hold weddings at Glasson. Glasson Hotel & Golf Club is delighted to offer you the option to celebrate your special day with an intimate wedding blessing or civil ceremony in one of our beautiful banqueting suites. Following the ceremony , your chosen menu can be served to your close family and guests in a separate banqueting suite. The wedding setting. Glasson is a former family farm with a manor house that dates to 1780. 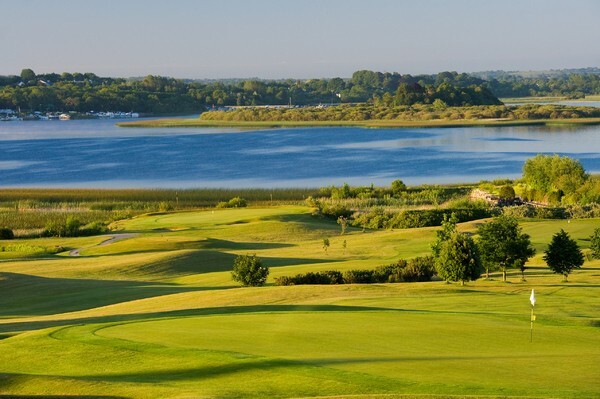 The former farm is now one of the best golf courses in Ireland and the golf club has superb views of Lough Ree and the surrounding countryside. A convenient wedding location. Located in the true geographical centre of Ireland, family and guests will find that it's less than two hours from anywhere in Ireland; the drive is just 90 minutes from Dublin along the new M6. A dedicated wedding specialist. You don't have to worry about anything at the wedding reception as we can organise everything for you and your family. Just tell us what you want and we can get started. Menus are "suggestions" and not dictated to you. Tell us what you want and we will strive to find it for you. It's your day, after all! Exciting Menus to Suite all tastes. The food on the wedding menu primarily features local produce. All inclusive Wedding Packages available. Approved and reliable "service providers" such as photographers and DJs. On-site accommodation. Beautiful 4-star rooms and suites with views of the lake and golf course are right upstairs after the wedding. "The Glasson Experience should be bottled and given to all involved in Irish Weddings." "Ask us what you want and we'll give it to you." That's our motto when it comes to weddings. From the moment the bride, groom, and family arrive, you'll be pampered and provided with everything you need for an enjoyable weekend. You'll find that we are totally committed to making sure that your special day is wonderful for you, your guests, and the family. Glasson Country House Hotel - Lakeside Wedding Venue is a superb family-owned Hotel Wedding Venues in County Westmeath servicing weddings throughout the local area including the Village of Glasson, Athlone, the Midlands and easily accessible to both Galway and Dublin. Glasson Country House Hotel - Lakeside Wedding Venue is a family-owned Property with a stunning Lakeside setting and a Hotel Wedding Venue that has a reputation for delivering top quality Food and has been part of the Hotel Wedding Venues industry since 1993 specialising in truly memorable occasions..
We had our ceremony and reception in Glasson Country House Hotel. Everything was amazing - our guests sung the praises of the venue, the food, the wine and the service. The weekend was flawless and we had so much fun. The attention to detail was great and even though the staff do this for so many couples every week - Gareth, Fidelma, Irene, Tony and the rest of the team made us feel so special and unique. The location and venue are absolutely stunning with breath taking views of the lake. From the day we made our first enquiry with the venue right up until the wedding day - communication and responsiveness were top notch. A big thank you to everyone! Very smiley, friendly staff & management available throughout the day for support. Food plentiful, bar service efficient. Highly recommend Glasson for weddings. Worked closely with Gareth in the hotel and he was great to deal with. Food was amazing on the day and all guests were talking about it and the service. Excellent venue all round. We got married in Glasson Golf and Country Hotel in October 2018. From the start of the planning process we couldn't have asked for a better service. Gareth and his team are so professional yet so friendly and helpful, no matter what the request. We had both our ceremony and reception at the venue and we were thrilled how smoothly the day ran. Despite the bad weather everyone commented on what a fantastic day it was. In particular the food was amazing which all the guests praised. We really had a brilliant day and we would happily recommend Glasson Golf Club. Gareth and all the team at Glasson were fantastic support from start to finish. The venue is spectacular, the views are amazing, food is incredible. The service is beyond excellent. we could not fault it at all. We highly reccommend Glasson as a wedding venue.It has everything you are looking for . We had our wedding reception in Glasson Country house hotel on 14.09.18. We would highly recommend this place as a wedding venue. Food was fantastic and Gareth and Fidelma were always available to deal with any queries we had on the lead up to our wedding day. The staff were very helpful throughout the preparations. They did everything they could to accommodate our wants. The food was excellent and prompt on the day. The guests were very complimentary about the service. We were extremely happy with our Glasson Country House wedding reception in August. Firstly the setting and photo-taking sites are beautiful and numerous. Fidelma and the entire team were always a pleasure to deal with and each and everyone was extremely accommodating on the day. The food was amazing and wine was flowing nicely. Our guests were all very happy with the food and especially the friendly and accommodating staff. We had a particularly international bunch with a good few infants to cater for too and some dietary requests but this was no problem to the Glasson team. Bridal suite and accommodation in general is beautiful. The whole planning process was made very easy for us and the dining room looked stunning on the day. I was quite an anxious, indecisive bride but nothing was ever too much trouble for the team. Also they managed to find the bluest hydrangeas I have ever seen which was like a dream come true for me :) Would highly recommend to any couple. We arranged out wedding in Glasson in four months. From the start Gareth was fantastic. Nothing was too much trouble. All my silly questions were answered in no time. As for the day itself, everything went off without a hitch! My bridesmaids and I stayed the night before and got ready there, the morning of. Everyone in the hotel knew we were the "special guests" and they looked after us so well. Anything we asked for, we had within a matter of minutes. Throughout the reception Robin and Gareth were there to ensure all was perfect. The food was absolutely amazing!! Our guests are still talking about their dinner. A few of our guests are vegan and they could not believe the choice available to them. Several have said it was the best food they've ever had at a wedding. The views here are stunning, even on a wet day like ours. If you're thinking of booking your wedding in Glasson, do it. You won't be disappointed. We had a wonderful day with no regrets. The staff in Glasson hotel were all so helpful, friendly & approachable. The food and the stunning views were commented on in such a positive way from any guest we've spoken to. The venue is beautiful for photos also. Any queries along the way were answered so quickly by wedding coordinator. Special thanks to Gareth for assisting along the way. Everything was made so easy for us. When you turn onto the drive way entrance of hotel you will want to get married here! From our first viewing of Glasson Country House Hotel we knew it was the venue for us. The stunning location on the shores of Lough Ree was just one of the many reasons we chose this venue. The wedding co-ordinate Gareth was a pleasure to work with, as we live abroad he helped make the day very easy to organise. Our wedding day went off smoothly thanks to the great work by all the staff at Glasson. Our guests were very complimentary about the venue and they especially enjoyed the canapés and the evening meal. We would definitely recommend Glasson Hotel to future couples. Highly recommend, everyone loved the food and service and nothing was a hassle. If a big hotel isn’t your style and you are after a more relaxed country house style, this is fab. No need for additional costs for draping the room as the backdrop of the grounds is a lot nicer and the layout keeps everyone together and none can drift off. Glasson is a family run hotel with that extra special touch, we found them to be accommodating in the lead up to, the day of and days after the wedding. The food is excellent and the service was also top notch. You will be guaranteed a great day and night in the Glasson Hotel and Golf Club. We had an amazing wedding day at Glasson Hotel. From the first meeting to follow up after and everything in between Gareth, Robin, Fidelma and the whole team at Glasson went above and beyond for us. On the day itself the staff, food, quality and overall service and kindness was outstanding. The guests are still talking about how good and amazing the hotel was more than the rest of the wedding day! The food (both quality and amounts) were superb.. with guests who wouldn't usually eat much getting second helpings! Anything I asked of the hotel there was no hesitation to do or help with! We had our ceremony here as well as the reception and we couldn't have wished for a more beautiful day with such beautiful surroundings too of course. I would do it all again and wouldn't change a thing! Highly recommend to anybody that Glasson is the perfect venue for your wedding! From the moment we viewed Glasson Country house, we fell in love with the views, the venue and the relaxed and welcoming atmosphere. Fidelma and her team made our wedding day the best day of our lives. They went above and beyond to ensure every detail was perfect. From the service on the day, the food, the way we were treated and looked after was 5 star. I would definitely recommend having your wedding here. A gorgeous venue managed by a professional and friendly team. We would like to express how thankful we are for everything. Our bridal suite was beautiful with stunning views from the balcony. We felt very special with all the extra little details the hotel staff provide. We look forward to visiting again soon. Glasson Resort were so helpful in every way, all the advice was spot on and it's clear they have done this more than once. With severe weather warnings Glasson had all services running perfectly, I can't thank them enough. Super helpful, accommodating, reliable trustworthy and an absolutely stunning location. We recently got married in St Mary’s Church Athlone and had our reception in Glasson country house & golf club. We knew straight away when we viewed Glasson that it was the place for us. A welcoming family owned business on such beautiful grounds! From start to finish we had the most amazing day and are so sad it’s all over. We live and work in Toronto so all our communication was done through email, mainly to Gareth! Gareth was fantastic, giving us lots of advice and helping us with any queries along the way. I’m sure we drove him crazy with all the emails! All our guests are still talking about how they had such a fabulous day, the beauty of the hotel! The fantastic food that was served at the drinks reception and for the meal! The excellent service and welcoming from the staff! The beautiful rooms which they stayed in! We had our day after party at Glasson also Gareth arranged a bus for us to bring our guests into town and return that evening. We also had a fantastic buffet for all our guests, which was a welcome treat to everyone!! Glasson went above and beyond all our expectations, we can’t thank them enough!! We had the most amazing day of our lives and have lots of memories to treasure thanks to everyone at Glasson Country House. Amazing venue, food and hospitality. From start to finish Gareth and all the team were so helpful and great to deal with. They made it feel like it was the only wedding they had. Thank you so much again to Glasson, we could not recommend this venue highly enough. My husband and I had the great pleasure of getting married in Glasson Country House Hotel. The staff were wonderful and attentive. The meal was beautiful and all the guests commented on how generous the portions were. Gareth and Fidelma were so helpful and kind to both our families. The guests rooms were large and spacious. The whole experience was wonderful and they provide a great second day entertainment which my family loved. We are so grateful for the wonderful experience we had. Glasson Country House were absolutely fabulous in every way. They were very helpful in the lead up and outstanding on the day. The food was absolutely delicious (guests are still talking about it to this day) and were so attentive on the day. It was the little things and the attention to detail on the day that we will remember. One of the very young children started crying during the meal and one of the very kind staff came over and walked around the room with the child in her arms until he calmed down...little things like that are hard to find! Our numbers were quite small.. 86 on the day, but they were able to divide the room so that the crowd appeared huge on the day! And that view..to die for. Highly recommend! Everyone at Glasson was so friendly and welcoming. Their wedding packages are bit more expensive then other local Athlone hotels but it is worth every euro you spend. The setting is stunning and the hotel is beautiful. Enjoyed a wonderful wedding weekend in Glasson. We cannot fault them, all of the staff were so helpful and personable. Nothing was too much to ask for. The food at our reception dinner was delicious with very generous helpings. Thankyou Fidelma, Gareth, Robin and all the staff. Our Wedding Day was a Dream Come True, forever gratitude and thanks to Glasson, for their expertise and professionalism. This venue is simply stunning. My new husband and I would like to award it 5 stars. We got married on the 18th of March 2017 and our reception was held in Glasson Country House Hotel. Having searched all around Ireland for the right venue for us for weeks, we finally found Glasson Country House. We fell in love with this scenic, elegant beauty just outside Athlone. A warm and inviting atmosphere awaited us every time we visited. The planning process was made much easier knowing that your wedding was in safe hands! Its attention to detail is second to none. Everything we needed, we received immediately. Thank you sincerely to the management and staff for the outstanding service they provided and for making our wedding such a memorable experience - one we will never forget.I cannot wait to see our professional photographs. We had an amazing wedding day at Glasson Golf Club and I would highly recommend it to any bride and groom! Gareth was extremely helpful, friendly and flexible from the start. All of the staff were very helpful and accommodating to our guests. The hotel itself is beautiful inside, the views are fabulous, the food was delicious! We chose the steak and hake as mains, we got so many compliments on the food, wine and service. There are plenty of options for amazing photos around the grounds and you are whisked off in the golf buggy to save time! Glasson Golf Cub was an excellent wedding venue, with excellent staff and exceeded our already high expectations. Thank you to all of the team there! All of the Glason staff, was so lovely and helpful the day of the wedding and we couldn't ask for a better day. We were delighted with Glasson Hotel the staff were friendly and very helpful.The service was excellent and we be happy to recommend this hotel to any couple getting married in the future. First of all, we travelled from across the globe to have our wedding here and it was perfect! We had stayed at the venue years ago and knew it would be the ideal place for our wedding. Our planner, Gareth, was extremely helpful from the beginning. We were planning from overseas and did most of the logistics via email, so it meant so much that Gareth was prompt, proactive and gave great suggestions. All of the staff were immensely helpful and organized as well. They went above and beyond both during our planning and on the day, doing everything to accommodate our requests and made our day perfect. They really made you feel at home and looked after. They worked with and accommodated our outside vendors (cake, music, photographers, etc.) as well, in a professional manner that made everything run smoothly (and kept us calm!) They were flexible with the menu selections and everyone LOVED the meal. One of the staff even escorted the groom and myself and the photographers on private golf cart to places around the grounds in order to take the perfect photographs. We had the perfect day and our guests did as well! Wouldn't have had it any other place - five stars! We held our wedding reception at Glasson House Hotel- what an amazing weekend of wedding celebrations we had here. Huge thanks to Gareth, Robin, Fidelma and all the team for all their help throughout the weekend and with all the preparations. They were an absolute pleasure to deal with. We got plenty of great feedback from our guests and we would not have a single complaint. The food, rooms, service, etc were all top quality. We had a group of approx 60 staying for a second night and after our boat trip with Viking Ship Athlone and a few drinks in Sean's bar we returned to the hotel for a delicious buffet. We loved everything about our wedding experience at this hotel and wouldn't hesitate to recommend it. Everything about this venue was amazing. From the very first meeting that we had with the hotel we were happy with our choice. On the day the reception we all got when we arrived was amazing and our guests have nothing but good things to say. The food was fantastic and the service impeccable. The personal touches and care taken made our day so much more special. We got married in Glasson Country House Hotel this summer. The management and staff were an absolute pleasure to deal with, all of their preparations paid off and everything was perfect. I genuinely mean it when I say that, we could not find a fault if we tried. Our guests are still talking about the service, food and scenery and we have been told it was the best wedding venue they had ever been at. We had a very definite vision of how we wanted our wedding to play out and Glasson made it happen! From the moment our car pulled up at the door on the Saturday until we drove away on the Monday, we were treated like royalty by every member of staff. Every last member of staff we encountered was so friendly and so many stopped to talk to us over the Saturday, Sunday and even Monday to congratulate us. It meant the world to us that our families and friends were so well looked after. The attention given to us all was certainly noted and so very much appreciated. The food was out of this world and is still the talk of many of our guests when we meet them. It was the best food I've ever had at a wedding and I'm a fussy eater! The scenery surrounding the hotel was amazing and our photographs were made all the more special by the beautiful views in the background. Gareth’s pleasant disposition and warm welcome whenever we visited, always put us at ease. He made it so stress free for us! It was great to have had him by our side since 2014 when we first enquired! We never looked back, what a wonderful decision we made way back then! We can highly recommend Glasson Country House Hotel to any perspective couples! We recently had our wedding here and it was such an amazing day. The staff in the golf club were exceptional, they were professional and very happy to help. The food was amazing. I couldn't believe how smoothly the day went. They are experts at weddings in my eyes and we would highly recommend them to any couple looking for wedding venue. Excellent venue with excellent staff. Had a fabulous day and so did our guests in a relaxed but professional setting. Enjoyed every minute. Could not recommend Glasson country house hotel more! From the staff to the food to the over all experience it was just incredible . Being a family run hotel Glasson provided such a personal touch so you never felt like just another wedding! Their gave you their full attention from the word go and nothing was ever a problem ! The staff are a complete credit to the hotel . The grounds and lake speak for themselves . When you put t it altogether they offer the complete package for your special day ! If you ask me it is a hidden gem and we couldn't be happier with the day we had ! Excellent service from Glasson, Fidelma and the team were very accommodating from the outset and every effort was made to make us have a hassle free day. Food was excellent and plenty of it. Guests were very impressed! Absolutely fabulous wedding venue. Professional yet personal service. No stress involved from beginning to end, you are in safe hands in Glasson. Gareth, Robyn and all the team do a perfect job of making the day run smoothly. Food was top class. Accommodation is fabulous. Could not recommend Glasson highly enough. Sad we can't do it all over again!! Superb setting. The grounds provide gorgeous photo opportunities. Staff are so lovely and will go out of their way to help you in any way possible. Food and drink is excellent. Rooms are so luxurious and comfortable. Cannot recommend enough. Really well run family hotel! We had an amazing day & thanks for everything. Aine & Vinnie. All the staff were exceptionally helpful and Fidelma in particular went above and beyond to meet any requests we had. Hi. We got Married in Glasson in December and had a fantastic few days. The staff were excellent and treated everyone like they were family. We had a lot of kids at the wedding also, and they were catered for excellently. We had steak for dinner and it was cooked to perfection for all our guests. I would highly recommend Glasson as a wedding venue. We had a fantastic wedding reception in Glasson. Gareth and his team were very helpful and a pleasure to deal with on the day and in the year planning the wedding. We live abroad and they were always available via email They were helpful to the guests travelling long distances the day before by putting on extra food. On the day the food was great and plentiful. The venue is stunning for photos, there are opportunities by the wooded area at the entrance and jumping in a golf buggy to go down by the lake. Ours being a Christmas wedding, I felt it was extra special with a huge tree in reception. Thumbs up all around! This is a Fantastic venue and we had top quality service and standards from day one of booking. Accommodation was perfect for guests with the option of booking a house on the grounds. Wonderful atmosphere in December with fires and decorations. We couldn't have been happier with the way our wedding day went, and it was all down to the venue setting and the staff who went above and beyond for us and our guests. We hated leaving there after the wedding but we'll be back for many visits in the future! From the very beginning the staff in Glasson Country House could not do enough for us. No request was to big for them and they made the whole process so effortless and stress free. All of our guests commented on how friendly staff were on the day and how accommodating they were with certain requirements. From Staff taking both mothers facinators to their room after dinner, to the bridal suite been all set up for us with curtains closed and lights left on. It was all the small details that made it so unforgettable. They really could not have done anymore for us and helped in such a big way to make our wedding day a day to never forget. We really cannot recommend or thank them enough. Everything and everyone from the hotel were very helpful. Food was fantastic as well as the service. The only thing that let us down on the day was the weather!!! The Glasson team really went above and beyond. Couldn't rate them highly enough. Dealing with Gareth from the get go was an absolute pleasure. We were in Australia when we first started looking at venues and he was always so responsive to emails and excellent at clearing up any queries we had no matter how big or small. So when we arrived home and decided to book our wedding it was always going to be Glasson Country House Hotel. The setting is fantastic, views incredible and the staff just so pleasant. On our wedding day, we had an hour long drive from the Church to Glasson, and things ran a bit later than originally expected. Gareth was on hand immediately with a golf buggy to transport us around the grounds to get our photos taken and made sure everything was done quickly and beautifully (we didn't want to miss much of the drinks reception of course) Gareth knows the place like the back of his hand and was able to suggest some additional photo opportunities. We were really blessed with a gorgeous day so we and our guests got to take in the beauty of the hotel and its grounds. Once we got back for the drinks reception, there was no problem with pushing the call for dinner back 15 minutes or so to give us some extra time with our guests before dinner, this was very much appreciated. We were enjoying ourselves so much that, I of course, was forgetting to eat the beautiful food which was presented on arrival, so you can imagine it was a treat when Gareth caught up with me and followed me around with a plate of sandwiches as a gentle reminder!! As and from this point everything ran like clockwork. We had 220 guests and everyone was seated so quickly, we had our entrance then and almost as soon as we sat down our starter was served and we were ready to start the speeches two hours later. We are still getting comments on the quality of the food and the very generous servings and seconds. People said that everywhere they turned there was food, which is fantastic especially when people travel for a wedding. Our guests were completely in awe of this venue, most had never been to a wedding here before and they thought it was so well laid out and extremely professionally organised. The dance floor is in the prefect spot, it is the perfect size, and there was absolutely no delay in moving the two tables that were there during the meal. One comment we have gotten over and over again is on the layout of the room and how there doesn't need to be much movement or disruption after the meal so everyone stays put as the band set up rather than disappearing to the bar, as we know it can be hard to get people back in to the swing of things once they leave the room! We danced the night away, the staff were so pleasant and even though there was a pretty late finish, there was not one complaint from the night staff. You can tell that they actually enjoy working there and that makes a huge difference. Tom, the owner, went round and spoke to our guests too which was a nice touch. Robin, thank you for helping us with the menu and making sure things ran smoothly on the day. Fidelma was also a pleasure to deal with, so down to earth and professional at the same time. The reception staff were so good when Hubby went down the day before with all of our bits and bobs (I was too busy so flung him in the deep end), the bar staff took everything in their stride… I really can’t say enough. Finally, a massive thank you to Gareth, you were like a wave of calm over us every time you came up to chat during the day, so relaxed and absolutely always smiling. Our only problem now is that we want to do it all over again!! Thank you Glasson for a wedding day that neither we nor our guests will forget! The Glasson House Hotel team were amazing from the get-go. As we were living in Melbourne, it made arranging our wedding in Ireland all the more difficult but little did we know when selecting Glasson House Hotel it would come with the most professional, dedicated, warm and friendly service. Gareth and Fidelma made us feel at ease from the start - none of our requests or changes were ever too big or small. The accommodated us in many ways throughout the process, whether that be how we wanted the table setting to be arranged, what flowers could go where or what colour to set the lights - it was handled with ease and we always felt like we were top of their list. As we had traveled from Melbourne, along with many overseas guests, the accommodation team ensured that our family, closest friends and long haul guests had the best rooms available and greeted our o/seas guests by name welcoming them to Ireland. We also held a full day 2 of celebrations at the Hotel, and on Gareth's recommendation we booked a boat trip to Sean's pub followed by BBQ for 120+ guests back at the hotel on Sunday evening, we had live music and full bar services. Our guests were wowed by the service we had for the entire weekend and the food was impeccable. Many walked away saying it was the best run wedding they had been at, with others booking return weekend get-aways to play golf or just rest and relax with that beautiful outlook. We would most definitely do it all again at Glasson! I would highly recommend Glasson as a Wedding venue - its a family run business and it really feels that way. Thank you to all!! We knew from the minute we drove through the gates at Glasson Country House Hotel that we wanted to have our wedding reception there. We looked at a few other places but they didn't come close to Glasson. Gareth looked after us from day one and anytime we asked him anything he responded immediately. Nothing was ever a problem and that took the pressure off us which we were glad of. The day itself was fabulous and everyone praised the venue, the food and the accommodation. We were delighted that we chose to have our wedding reception there. Both staff and management where so helpful in our big day . Hotel was set in a beautiful area of Ireland . Amazing venue, stunning views, beautiful food and the most friendly staff. We had the perfect day!! Superb location for a wedding and a top class hotel and service provided. Excellent venue. Staff extremely helpful and always available for a phone call or meeting. Highly recommend! We had a wonderful day and could not find a single fault with the service or venue. We had an absolutely wonderful day on Feb 7th, and it was mostly due to the hard work, kindness, organisation and service of all the staff at Glasson. We could find no fault with Glasson on our big day. It would take us hours to go through everything that made us enjoy the Glasson experience, but here are our highlights: (1) The warm welcome we received every time we walked through the door; (2) The quality of the response by the front desk team every time we had a query about the day or room bookings; (3) The venue is absolutely stunning, and is purpose built for weddings; (4) Tom being there EVERY time we visited Glasson! (5) They were always very reasonable in our negotiations, and were incredibly fair in the way that they dealt with the late cancellations; (6) The breakfast (both mornings) was absolutely outstanding, and as good, if not better, than anything we had on our mini-moon; (7) The rooms were superb, were incredibly clean, and beautifully designed. The bathrooms were outstanding and the heated tiles are a huge plus; (8) The food at every juncture was simply amazing - the amount of complements we have received on the food since the wedding has been incredible. The vol-au-vents and beef in particular were outstanding. It really is Glasson's trump card; (9) The French wine was the best we have ever had at a wedding, and 2-3 people have also commented to this effect; (10) The "performance" of the sparkling wine popping ceremony for us - it was greatly appreciated and worked out very well; (11) The table planning process was very easy for us indeed, and the layout on the day worked superbly well; (12) The buzz in the bar upon our arrival was electric - if you could bottle that buzz you could make a fortune; (13) The staff in the residents' bar were very easy-going and friendly and were very accommodating towards the few people who had a little too much to drink; (14) The late time for breakfast the next morning was greatly appreciated; (15) The reception area and fireplace were brilliant areas the next morning for saying goodbye to people - it was so relaxing; (16) Everything was left aside professionally for us the next morning - the cake, the flowers, the presents, the bill. And there were no surprises with the bill; (17) The owner offered to go to pick up Hazel's bag when we thought we had left it behind us - the owner offered straight away and it showed to me the care and dedication they had towards our wedding party. The three things that make Glasson the best wedding venue in the country, in our optinion, are: (A) Service - family-run feel to the hotel and everyone meets the highest standards; (B) Venue - absolutely stunning and purpose built for a wedding; (C) Food - second to none. It brings a smile to our face just remembering everything we loved about Glasson. I know every couple is probably biased about their wedding day and their wedding venue; but we are 100% sure that it was the perfect venue for both of us. We had the most wonderful wedding at Glasson. All the staff there were fantastic and couldn't do enough to make our day so special. The service was personalised and all our guests commented on what a great venue it was. Food was excellent. We would highly recommend to anyone thinking of having there wedding in Glasson. Top class Service from Gareth and all the staff! Everything went off without a hitch,food was amazing and all our needs were catered for. Got married in mid December and the hotel had the perfect Christmas atmosphere. Would advise everyone who is thinking of getting married to view Glasson and see what it has to offer. We would highly recommend Glasson Country House Hotel as a wedding venue. We are so grateful to Gareth, Robin and their team for producing for us such a smoothly run day. Both my husband and I were relaxed and confident that we had nothing to worry about which is exactly what you need and we were right. The day went without a problem and the service was of the highest standard. We couldn't of asked for a more professional and accommodating team to take care of all our needs. I would tell any bride and groom to seriously consider choosing Glasson. Amazing venue, amazing staff! Cannot recommend highly enough. Amazing Venue, surroundings & such lovely people to deal with, Glasson will always hold a place in our hearts, love returning to this stunning hotel for Special Occasions & Sunday lunches. Have recommended it to so many friends & family. We had a beautiful wedding day in Glasson Country House&Golf Club last September.We were glad to get a sunny day which showed off the hotels views of the lake,forest and golf course.This is a perfect wedding location, the food was great and presented well to our guests.The staff were always friendly& Professional.Nothing was too much trouble,we always felt at ease.We mainly dealth with Gareth,he always responded to our e -mails very quickly& met us with a smiley face.??????? ?To all the future brides ...Myself and my husband highly recommend this hotel,the staff work well together.They never once said no to our ideas about our perfect wedding day.The day went smoothly.Thank you to all the staff see you at the weeknd ...we are celebrating our year anniversary.???? We were so well looked after, that we really didnt have to worry about the day, once the big things like church, venue and invites were sorted. We pretty much let Robin guide us and how to make the most of our day and it felt easy. 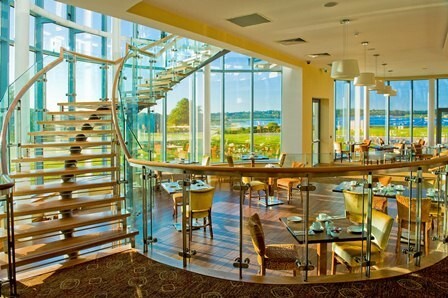 The food is always top class and sometimes i forget (as i know it well) how stunning a location Glasson really is. All our guests couldnt believe there was a venue of this quality in the midlands. From the moment we booked glasson, staff were the most helpful and accomodating group i have ever come across. We booked a year in advance on recomendation from a friend of a friend and could not have been happier. I (the bride) felt like an absolute princess from the first day and carried right through till the day after, your hospatility is second to none and i mean that. Couldnt believe it when i left the room for the church (in a mess as bridsmaids/brides do!!) and came back later to find it immaculate and complimentary luxury goods from glasson, honestly its little things like that that make a brides day even more special than it already is! i cant say enough for gareth (ur a star), robin (food was AMAZING, golf carts you arranged to bring us down to the jetti were Ciaran and the groomsmens highlight!!!! ), Fidelma, Louise and all the staff, honestly i cannot say enough about all of you! Even nanny cotter was impressed about the accomodating service you gave her, thanks, means alot! and you kept my bridal boquet alive and well for me to take home! ha! Well we're off now on honeymoon, but honestly for any brides-to-be who are looking at venues its amazing, and for a weddng, you lot made it the most hassle free day i've ever had, and that's not easy to say after weeks of planning a wedding day! thanks again, see you next year for the renewal! ha! Hi Gareth/Robin and all at Glasson, Just a quick note to say thanks so much for a wonderful day on the 1st July. The service and attention we received on the day was second to none. Food was absolutely amazing and the feedback from all our guests has been so positive . Many of them have said straight up " that it was the best food they have ever had at a wedding." We go along with this view! We have actually met people in Galway who were not at the wedding that heard that the food was fabulous! The service during the meal , at the bar and in the residents bar was excellent. Nothing seemed like too much trouble. The venue looked amazing in the glorious sunshine that day and it was brilliant to be able to have the arrivals reception outside on the lawns. I would also like to thank Tom the owner for dropping up to us at the top table during the meal ...Nice touch and much appreciated. The dance floor was full of people dancing all night and the band commented how they liked playing there. The bedrooms were fabulous and all were commenting on the great views and the general comfort . The morning after breakfast was excellent . All and all we would recommend Glasson to anyone we know and I know that you will get plenty of repeat business as a result of the show you put on. We had people from Galway,Cavan,Cork,Dublin and Abroad and all commented that it was the best wedding they had been at . Also we would like to thank Cathriona/Marie and all the staff at reception for all the help prior to the wedding with room bookings and for being so friendly and attentive to all our guests over the couple of days. Review by David & Anna. We had our wedding reception for 100 guests at Glasson in December, with most people staying in the hotel overnight - we all had a fantastic time. Service - It’s a Family run business, with a friendly and cohesive staff. Fidelma, Gareth and the team were fantastic in organising the reception, as we did things remotely from the UK. They were always responsive and resourceful in sorting things out for us. The service on the day could not have been better. Robin was a star, quietly and efficiently ensuring everything ran smoothly and got lots of special mentions from our guests. It was a busy time for them with four weddings in a row and everything seemed to go like clockwork.Hotel & views - The location has great views over the lake and very picturesque especially for the photos. The hotel was clean and very comfortable. Food & wine - We chose wintery soup (celeriac and parsnip) and salmon for starters, beef and monkfish for the main. Lots of our guests (some of whom were local farmers!) chose the beef and it got thumbs up all the way, especially when they offered seconds. At the tasting session we met the head chef Shelia and she was so helpful in advising on the menu and accommodated our guests’ dietary requirements. They were in the middle of changing the wine list so the options were a bit limited at the time with regards reds, and so they agreed to us sourcing our own red which was very much appreciated. Breakfast was of a very high standard. From our experience we would highly recommend Glasson as a venue for wedding receptions. Review by Afshin Nasoodi and Patricia Egan. Glasson is a perfect wedding venue that really pulled out a perfect day for us. We're so grateful to everyone there for all their work and all of our guests were delighted too. The first wonderful surprise is the view that you get on entering the grounds. It truly is spectacular. The foreigners that came from Italy, Japan, USA, etc., all were stunned too at the vista over the lake and the lovely village nearby. Simply wonderful. The food was fantastic. We had Caesar Salad, Carrot and Corriander Soup, Lemon Sole or Beef for the main course and a selection of desserts. The food was all excellant and, again, all of our guests were very impressed. We have to say, we've been to many weddings with disappointing, industrial service, rubbery beef or dessicated salmon; rest assured you won't find anything like that here. The service was professional and friendly without at any stage being intrusive. In particular, the staff gave us a lot of great advice on the format of the day, speeches, cutting the cake, wine, etc., as well as the menu. We're indebted to them. We stayed in the hotel. The rooms are lovely, comfortable with very nice views in many of them. It's certainly a good place to stay with a large or small group. In particular, if you play golf (or if your friends or family do), then you won't get anywhere better than this. We don't play, but many of our friends enjoyed the picturesque golf course and the nice walk to clear the cobwebs from the night before. A small point to remember, but one that was important to us, is the location. Glasson is equidistant from Dublin and Galway (where we're from) but with the motorway it's really only an hour from either. It also proved very accessible as a result to people coming from Wexford, Dundalk, Belfast and Limerick, as it's in the middle of Ireland. Overall a great night and a great stay. We had our wedding in September 2010 and cannot praise Glasson, Gareth and all of the staff highly enough. They were all extremely professional and best of all genuinely friendly. They made Paddy and I as well as all of our friends and family very welcome. We were very relaxed as the staff took care of everything, down to always ensuring that I had a glass of champagne in my hand! The setting is exceptional. I stayed the night before my wedding and watching the sun rise over the lake from my balcony is one of the many highlights from that day. Gareth, David, Judith and the rest of the staff at Glasson, a very big thank you for making our day the best it could possibly be. Hi, On behalf of myself and Marie,I would like to thank you and staff for looking after us at our daugthers wedding. The combination of your warm professional staff,beautiful location and great food made it the perfect weekend. EXCELLENT seems an inadequate word to describe it. We had our wedding at the Glasson Golf Club on August 20th. It was the best day we could have ever wished for and it was made all the more special because we chose the Glasson. The venue, location and scenery are all spectacular – but what really had our guests talking were the service and the food. The meal was top quality and some commented it was the best meal they have ever had at a wedding. The staff could not do enough for us or our guests and made us all feel extremely special. What sets the Glasson apart is that you are not just another wedding to them; they go all out to make sure every moment of the day is special. The new wedding venue is so different to anything I’ve seen before, the light coming through the room, and the fact that the guests don’t have to moved after dinner as the dancefloor is separate, it’s little touches like this that add to the flow of the day. David Cahill in the Glasson said to me a few days before the wedding to leave it all in their hands and relax on the day and they kept their word and more, I was a very relaxed bride and could join in the celebrations while the staff ran everything on time. I cannot recommend the Glasson highly enough and if you’re considering it for your wedding don’t hesitate, you’ll have the best day ever. 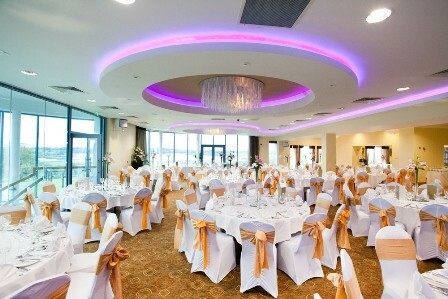 Just back from staying at Glasson Hotel checking it out for our Wedding on 20/05/2011. We'll all I can say is I cant wait, From the amazing function room to the breath taking views to the excellent and professional staff, We are delighted that we have booked Glasson. There was also a wedding on the Saturday nite that we stayed and all the wedding guests could not complement the food enough.We also ate both nights between the retaurant and bar it was mouth watering I would recommend for starter Tiger prawns wrapped in filio pastry on bed of fresh salad and chilli sause. Yum The steak too. If you are thinking of booking Glasson for your Wedding stop and just book it it was that good. Dear Gareth On behalf of ï¿½ and myself I would like to thank you and your Staff for looking after us so well at our daughters Wedding toï¿½. From the moment we arrived on the Friday until we left on Sunday I couldnï¿½t fault anything. Your Staff are warm, very professional, nothing was too much bother to them. The location is so beautiful but that on itï¿½s own would not have worked. The food was excellent both at the Reception on Friday and the barbecue on Saturday. Please congratulate your staff on our behalf and course you yourself ï¿½take a bowï¿½ as all these qualities flow from the top. Again our sincere thanks, all our guests had a ball. Got married last weekend in Glasson Golf Hotel and feel so strongly about the whole experience that I wanted to share even though I rarely post. It was without doubt the best ever and I'm sure that most people say that about their big day but the feedback from our guests has blown us away, even our video man said that it was the best wedding he had been to all year! Hotel looked amazing with the beautiful views and building. The scenary is fab with the red sky during the speeches and then a full moon over the lake was just beautiful. The staff were just unbelieveable. It really comes accross that it is a family run show as there is such great attention to detail and they were so friendly. Reception, this was brill. Even though the rain came, we got photos taken and when we made it to the reception, the atmosphere was outta this world. We booked a local trad band and the drinks were flowing so that was a great start. Meal, all I'll say is the food was great (lemon sole and roast beef).....yum yum :hyper: Dancing, I believe there were some concerns over the dance floor. Well ladies let me put your mind at rest. It was packed from start to finish! We had the lols band from moate who were class. The position of the dance floor was perfect. The fact that it was beside one of the bars meant even the non dancing bar holding up men were dragged to the floor O-O Girls the craic was MIGHTY, and I'll be back for all my new sister in laws future weddings. We got married at Glasson Golf Club & Hote lthere less than a week ago and I have to say that is the most amazing venue and it was better than I ever hoped for! we had looked at loads of venues from Dublin to Westport and I have to say Glasson topped them all. For starters it was the only venue that I have been to that the amazing views can be seen from the FUNCTION room. we found most other places tuck you away in a room with either no view or else no windows. our guests were able to enjoy the views not only during the reception drinks but also right the way through the meal up untill it got dark which wasnt till about ten or so. Our photographer was delighted too as there were so many photo op's in the grounds. we are dying to see the pics as we now that they will be gorgeous! secondly- the food was absolutely fantastic! we also went with the sole and beef choice and everybody was commenting on how tasty it was. we were so impressed that we got the chef ( Sheila) to come out and take a bow during the speeches! :wv Even the next morning at breakfast we were impressed by the food. we also had a BBQ the next day which went down a treat with all the guests. The staff - from the barman to the manager, couldnt do enough for either ourselves or our guests. They really did do everything to ensure that our day went without any hitches and that we enjoyed every minute of it. From arranging babysitters for our guests to coping with last minute changes to plan and requests they did everything with a smile. The layout of the functionroom is great as all guest can see you from their tables and also they all have a view which keeps the ones at the back happy! there was loads of room for the band to set up on and only a few tables had to be moved for the dancing for which there was lots of! the position of the dance floor worked out fine and as Pebbles3 said it was great not to loose the men who like to stand by the bar! so finally for anyone who has booked their wedding there - dont worry it will be the best day ever! I am so jealous that mine is over :o( and for anyone who is still looking for a venue - it is definitely worth checking out - at least three couple at my wedding asked would I mind if they used it for their big day! Im just glad il have an excuse to go back! Ask the Experts - How Much Wine Should You Allocate Per Guest?